NIA CHARLESTOWN NEVIS (August 19, 2014) — Crime and security remain high on the Nevis Island Administration’s (NIA) agenda and Premier of Nevis Hon. Vance Amory said they were matters that were actively being dealt with at the highest level. Mr. Amory who was at the time addressing the public at a town hall meeting at the Red Cross conference room in Charlestown which was hosted by the Administration on August 14, 2014, indicated that Nevis Government’s position remained one of zero tolerance where crime was concerned. “None of us need feel comfortable because crime does not see colour. Crime does not select and does not discriminate but we [NIA] are working closely with our Police Force. I had a meeting with the High Command two weeks ago just before Culturama – the Commissioner, his Deputy from St. Kitts, our Assistant Commissioner of Police here who is in charge of the Nevis Police Division and the Superintendent – to put together and refine and continue to implement measures to deal with crime in Nevis,” he said. According to Mr. Amory, since the Administration took office under his leadership 18 months ago, a number of measures had been taken to deal with the vexing issue of crime on the island. “We have had a lot of talk about crime and escalation in crime. We have had some high profile criminal activity but I want to assure the people of Nevis and the people who are listening… that we have put in place certain security measures – the Close Circuit Television (CCTv), cameras around Charlestown and we have stretched [them] from the by-pass road all the way to Value Mart. So we have the Charlestown area properly covered. 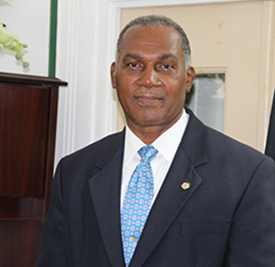 “It is true that we have not been able through them, yet, to capture but I think the footage we have on those criminal activities, we are certain that we will soon and very soon, be able to break the ring of criminal activity in those high-profile crimes which we have experienced which are not good for Nevis,” he said. Notwithstanding, Mr. Amory stated that the Police in the Royal St. Christopher and Nevis Police Force, Nevis Division, had recorded some positive results in crime detection and a reduction in crime. “I do believe, we have seen this year, up to I think its April, a reduction of 32 percent in crimes and we have seen an increase in detection of some crimes and I feel we will continue to see this decrease,” he said. The Premier also used the opportunity, to voice the Administration’s continued support for the Police stationed on Nevis. “In terms of our support for Police, we have, from our own resources, provided for the Police Force two vehicles to increase their mobility. “We are looking at providing communication equipment for them, so that they can have hand held radios and so on, GPS equipment, so that we can ensure that we are ready to deal with any matters of criminal activity in this country,” he said.